Faculty, staff, and agriculture students from SAU attended the Arkansas FFA State Convention this year not only to share their love for SAU with future Muleriders, but to also present educational workshops, participate in college information panels, and provide extra hands in helping with the state leadership contests. More than 2,200 high school FFA members and guests from across the state gathered for the annual convention and expo, which was held this year at the Bank of the Ozarks Arena in Hot Springs, Arkansas. “It is exciting to see so many young people interested in agriculture, and even more exciting that we had the opportunity to share everything that SAU has to offer the students that are wishing to continue their studies in not only agriculture but the other more than 80 various degree programs we have here at SAU,” said Caleigh Moyer, SAU admissions counselor/recruiter. Moyer, an SAU graduate and former Arkansas FFA state officer, chose to attend SAU the same year as two fellow SAU alumni and fellow former officers – Sunni Wise and Taylor McNeel (who went on to be National FFA president). At this year’s convention, SAU sophomore and retiring Arkansas FFA president Brady Gentry handed over the position to Dawson Smith, Arkansas FFA president-elect and incoming SAU student. 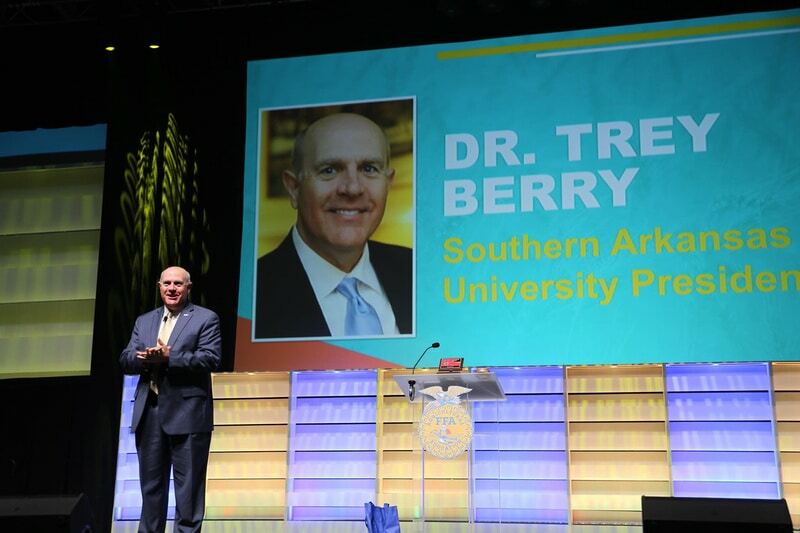 Smith will be the third straight Arkansas FFA president to choose SAU. The newly-elected reporter is Raven Randolph, who is also coming to SAU this fall. “I am proud to come from a University that has an extensive history in agriculture and one that continues to support the FFA,” said Moyer. Moyer and a team from SAU’s Enrollment Services provided FFA convention-goers with custom T-shirts and playing cards from their decked-out booth space. Plans are already underway for next year’s SAU presence.